Let's preserve our Mother Earth for future generations! Climate Change: a real thing and it is already happening! Hi there, this is the first post at TLP! I have started this blog to spread awareness related to the climate change and green technology domain. The idea is to bring forward the actual science and related updates to the weather and climate. It is truly amazing to witness the mathematics and logic behind all the natural phenomena which are witnessed by everyone on the planet. I will post more about deeper concepts in upcoming posts, meanwhile, why not start with the basic question: Is climate change real? Well, the short answer is “YES”! And, in this post, I will try to explain the climate change phenomena in a bit technical yet simple way. Also, we will see the depth up to which the threat is relevant to us as humans! Climate change does not respect border; it does not respect who you are – rich and poor, small and big. Therefore, this is what we call “global challenges”, which require global solidarity. How do we know that climate change is as real as sunshine? I will start with one of the most basic precursors to climate change, which is carbon dioxide concentration. On March 28, 2018, the CO2 concentration was recorded as 410.07 parts per million by volume (ppmv) Mauna Loa (Hawaii). Mauna Loa Observatory (MLO) is a premier atmospheric research facility that has been continuously monitoring and collecting data related to atmospheric change since the 1950s. The fluctuations in the above figure are due to the seasonal cycles (a cyclic variation of about 5 ppmv) of our planet. In the autumn season, there is less CO2 absorption by land vegetation in the northern hemisphere (where the most vegetation exists) than the spring season, so it is like breathing pattern of mother Earth (pretty cool!). For geeks, the plot shown above is called as The Keeling Curve (in the name of Charles David Keeling). It is a graph which plots the ongoing change in concentration of carbon dioxide in Earth’s atmosphere from 1958 onwards. See what we humans are capable of! We have changed the carbon dioxide gas levels at a much faster rate than the mighty nature. One more thing, how do we know the past CO2 levels? Thanks to the scientists who took the trouble to go to some of the coldest parts of the earth and dig there. 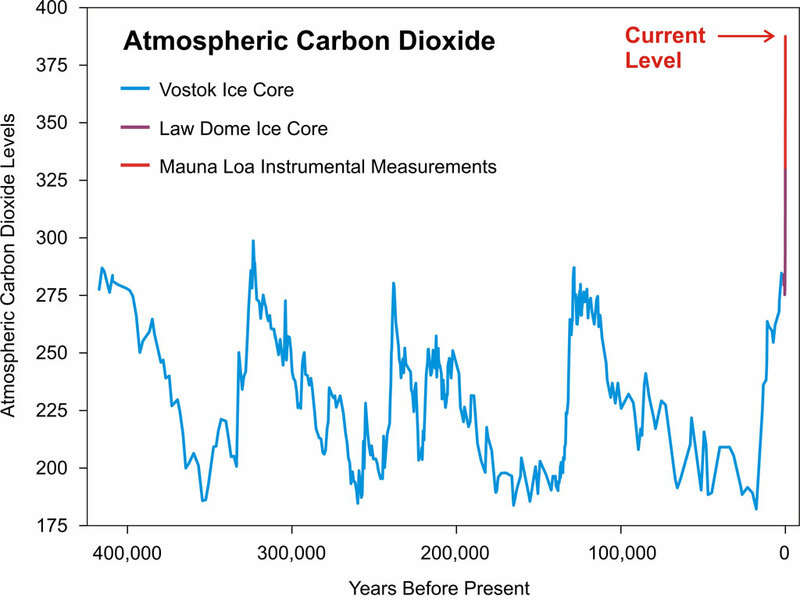 The past CO2 concentration was found by analyzing the ice cores which were carefully taken from the polar regions. There is air trapped between the ice and its composition can tell us about the past climate. You can see this video to know how ice cores are processed to know the past climate. 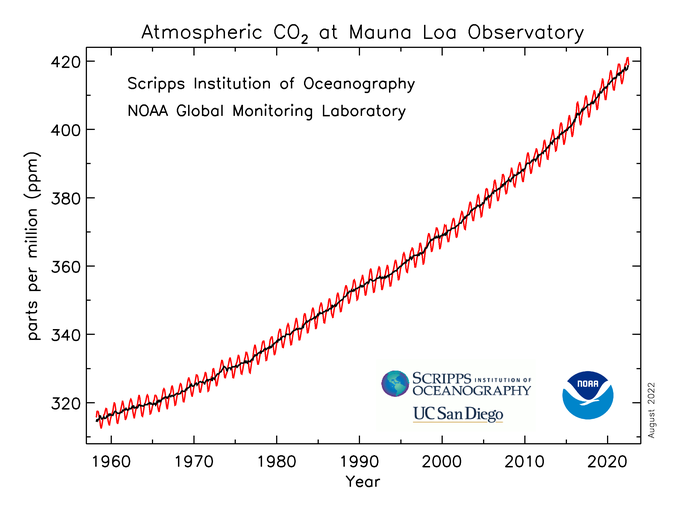 As you can see from the above figure, the CO2 levels have changed earlier as well. It was due to many other natural factors, for example, due to orbital variations (Milankovitch cycles) in the past, the earth had different climate and hence it changed the carbon cycle. Currently, the world we live in is totally different than the world when dinosaurs were roaming the earth. Before the industrialization in the 1800s, the earth had its own stable carbon cycle for thousands of years. The CO2 concentration before 1850 was roughly around 280 ppmv and within the span of 160-170 years, we (the humans) have added around 130 ppmv extra CO2 in the atmosphere. To see things in better perspective, one ppmv equals 2.13 GtC (gigaton of carbon…1 Giga is 1 billion with nine zeros and 1 metric ton is 1000 Kgs, hence one GtC is equal to 1012 kilograms of carbon!). It means humans have added close to 276 gigatons of extra carbon molecules in the atmosphere. So where does this extra carbon come from? Thanks (but no thanks!) to the industrialization, massive amounts of coal and fossil fuel were burnt without any regulations. Due to this a lot of emissions was released into the atmosphere. Later, World Wars happened which again fueled the industrial activity to a whole new level. Nobody knew back then if their actions could actually affect the whole planet. It was only in the 1970s when the ozone hole was found, the global scientific community started looking into it. But even today, there are a bunch of climate deniers (even at the highest echelons) who claim that it is just a hoax. There are enough such pieces of evidence which rest the case of climate change being a real threat to the planet. And, it is already happening. In recent years the frequency of extreme events such flooding, hurricanes/cyclones and droughts have increased significantly. I will write more about the extreme events in upcoming posts. Mitigate: We can make strategies to limit the magnitude or rate of long-term climate change. For example, reducing the emissions, planting more trees etc. Adapt: Even if we reduce all the emissions to zero levels, climate change will occur and it will take a couple of centuries to get things back to normal (yes, we have messed up that bad!). We have to decide our response to the climate change so that vulnerability of social and biological systems remains as low as possible. Geoengineering/Climate Engineering: It is a highly debatable topic in climate community and in my personal opinion it should be the last resort. Geoengineering is the deliberate and large-scale intervention in the Earth’s climate system with the aim of affecting adverse global warming. For example, putting sulphate aerosols in the stratosphere to control the solar radiation reaching the earth’s surface and hence offsetting the effects of global warming. In my personal opinion, we should be focusing more on the adaptation strategies. And, the good thing is that as humans we are good at the adaptation by evolution! I know I know, this post has been long so I will end this here and in upcoming posts I will write about some products/startups working towards the solutions to address the problem of climate change. Please feel free to comment and provide your feedback on the blog! PS: To know about my contact details, click here. Superb and expecting more from you.